Changing things up for 2014… To be honest, I was getting bored of the show scene and having a rather impractical car that I don’t drive very often. I decided upon the change after sitting in a friend’s S2000 early in the year, whilst he was booting it around corners, corners that I’d have to take extra slow in the Fit. I just miss the feeling of driving the car hard, and of course going to the occasional track day. The ball was rolling in June, I had already acquired a set of JDM 1.5s front and rear bumpers, so it was just planning out the rest of JDM swap for the next couple months. The SSR MS3R’s were fairly new and I didn’t want to put them to waste with a mid year change up, so I rode out the year on them. By the end of the season in October, I had started dismantling the Fit, for storage, and also to start test fitting parts. I was able to source a set of kouki Fit headlights as well as the brackets and supports needed for the JDM swap, thanks to the LEVEL one fam in Japan, specifically Hiroki. Couldn’t have done it without his help. Big thanks go out to him. So here we are. A dismantled Fit. First thing I tried is fitting the jdm bumper brackets under the headlights. Didn’t fit. lol. That piece cut out was hitting the mounting point where it should be going. Next up was test fitting the bumpers themselves, which require removal of the front and rear rebars. I’ll have to get a shop to fab up a tube based rebar that’ll fit the [much shorter] JDM bumpers. OEM quality so it fits on pretty well. Definitely digging the rear bumper, though the Greddy Evo II will have to go. The canister is HUGE when it’s exposed with this bumper. Not so much with the old Kenstyle kit. Next up is the front bumper. These bumpers came off the AJ Racing time attack Fit which had an intercooler already, so thankfully the trimming they did also fits my Greddy intercooler & piping. Just a bit more trimming should do the trick. And the last thing done with the car so far was a test fit of my friend’s 15″ TE37’s. I wanted to make sure 15’s clear before buying a set for track. And luckily they do clear, though his set of TE37’s would require a bit of spacing, but that’s no big deal. Look for coverage again, probably at Illmotion & Stretch and Poke! It’s been awhile but the car is relatively sorted out now. Still rubs quite a bit but it’s somewhat drivable now haha. Pretty happy overall with the outcome. I wasn’t 100% on the rims off the car and indoors, but the finish really sparkles in daylight and I’m liking it a lot more on the car. Drove it to Jacky’s for an oil change and got a good look under the car too..first time in like years lol. Pretty stoked how the burn on the J’s Racing titanium test pipe is turning out. mounted the new wheels (sort of). Got the wheels and tires mounted and balanced at Speedstar during the past week and installed (well, tried to) them yesterday. Unfortunately, the fronts require a small spacer to clear the Endless caliper, just 2 or 3mm. It’s also a little more aggressive than I would’ve liked (the fronts anyway). I used a 5mm spacer and it pokes just a tad. Nothing a little more camber can’t fix but, it’s a bit more aggressive looking than the rears. The rears ended up fitting fine, had to shave/cut my rear quarters, where there’s a corner and it couldn’t be rolled. But it looks as though it fits, hopefully not too much rubbing issues. I have a set of SPC shims coming in soon so I can get it all aligned and run a bit more negative camber all around. I’m actually not wow’ed by the wheels on the car, unfortunately. Perhaps I should’ve went with a brighter silver like the old SSR Type C / Competitions I have. In any case, I like them – no doubt about that. Just not as impressed as I thought I would be with them on. I’ll judge again when the car is dialed in and everything fits. 2013 build on the fit. 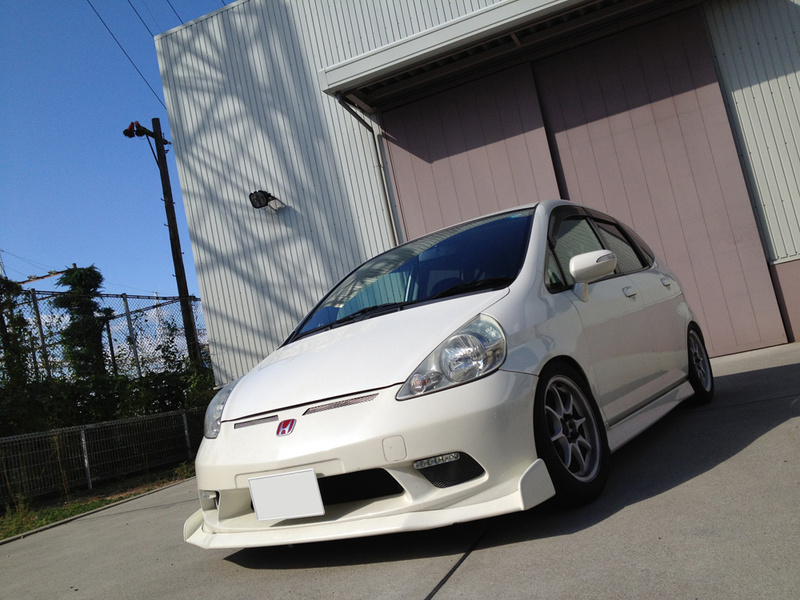 Nothing too crazy lined up for 2013 for the Fit… just audio and new wheels I think. oh how i long for one of these bumpers. finishing up for this year. Went back to Shinzo and got my mirrors wrapped, and installed a set of black headlights I picked up a few weeks ago as well. I think I’m pretty much done for 2012. One more show to go to next week (Import Expo) and that’s about it!